Obituary for Bill E. Nitsch | McCombs Funeral Home Inc.
Bill E. Nitsch, age 84, of Sedgewickville, passed away Tues., Dec. 4, 2018 at Saint Francis Medical Center in Cape Girardeau. He was born July 2, 1934 in Jackson, son of George and Amanda Hartung Nitsch. He and Jon Ann Grantham were married May 27, 1955; they were married 30 years when she passed away Dec. 10, 1985. He and Pauline Wachter Weber were married Sept. 29, 1989. Bill was a lifelong farmer. He graduated from Jackson High School in 1952 and served in the U.S. Army from 1957 to 1959. He worked ten years for MFA Oil Co. in Jackson and then 30 years for Associated Natural Gas in Jackson, retiring in 1997. 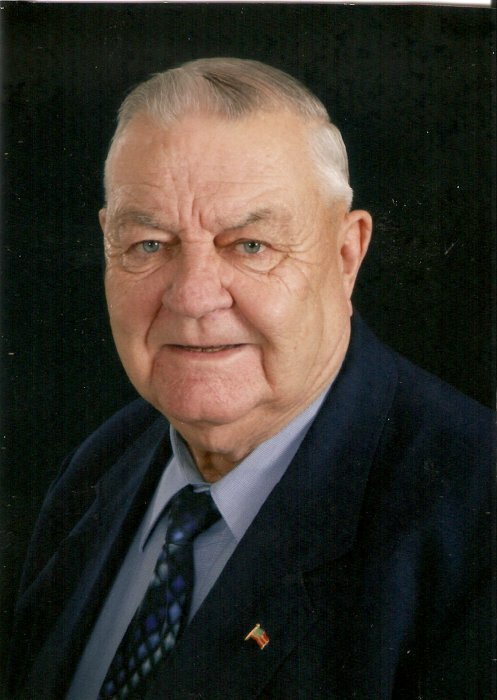 Bill was a member of the SEMO District Fair Board, the VFW in Jackson and St. Paul Lutheran Church in Jackson, where he served in various capacities. Loving survivors include his wife of 29 years, Pauline Nitsch of Sedgewickville; two children, William N. (Kristi) Nitsch of Sedgewickville and Suzanne (Kevin) Fluegge of Millersville; three grandchildren, Luke Nitsch and Dillon and Justin Fluegge; three step daughters, Christine (Ronald) Lungwitz of Jackson, Rebecca “Becky” (Donald) Lewis of Brazeau, Missouri and Carla (Steve) Roth of Frohna, Missouri; many step grandchildren and step great-grandchildren. In addition to his first wife, Jon Ann Nitsch, he was preceded in death by a teenage son, Joseph Nitsch; his parents; two brothers, Marvin (Ruth) Nitsch and Bob (Gladys) Nitsch. The visitation will be from 9 to 11 a.m. on Friday, December 7, 2018 at St. Paul Lutheran Church in Jackson. The funeral service will be at 11 a.m. on Friday at the church, with the Revs. Eric Longman and Joshua Schmidt officiating. Interment will be in Russell Heights Cemetery in Jackson, with full military honors. The family suggests that contributions be made to Missouri Veterans Home Foundation or St. Paul Lutheran Church.